Though Alpha Omicron Pi is the newest sorority on campus, its history spans over a century. Founded in 1897 at Barnard College, AOII seeks to start a new chapter at UCSD and will select its colony class — no larger than 106 women — tomorrow during its bid night at 7 p.m. at Price Center Ballroom West. Hays, who graduated from Cal Poly San Luis Obispo in 2012, was an active member of AOII in her community, serving as a Panhellenic delegate, philanthropy chair and eventually, Panhellenic president. As philanthropy chair, she organized a Mr. Fraternity pageant that raised $10,000 for the Arthritis Foundation; as Panhellenic president, she led all of the sororities, which together comprised of 1,500 women. Hays’ dedication to the sorority led her to her current position at AOII. She hopes that her passion and commitment to AOII will spread to UCSD with its colony class. AOII was introduced to UCSD due to the high volume of membership sizes and increased interest in Greek life. The Panhellenic committee, which manages UCSD sororities, determined that UCSD needed another sorority to alleviate the burden on the other sororities with maxed out membership sizes. As a result, they extended invitations to multiple sororities. AOII was selected as the best fit for UCSD on Oct. 21, and since then, there has been a whirlwind of activity ramping up to recruitment. Two educational leadership consultants from AOII have been on campus since Jan. 10, spreading the word about the new sorority. As a colony class, no one quite knows what to expect of AOII in its first year, though according to Hays, an emphasis is placed on finding “servant leaders” — women who are dedicated to serving the community through their leadership. Recruitment for the sorority, which took place this past weekend, consisted of group membership appointments that essentially served as group interviews. There was also a networking event — Picture Yourself in AOII — where women met with alumni to learn more about AOII. Preference, an invitation-only event for those that AOII would like to potentially accept, will be held tonight at 7 p.m., where those selected will discuss possible sisterhood. Tomorrow is the grand finale, when bids are extended and women are officially accepted. 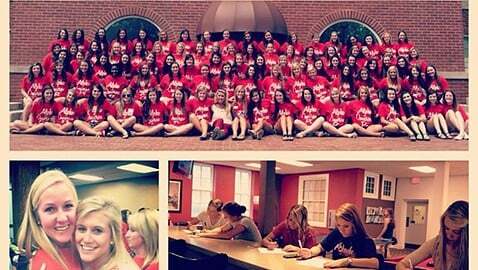 Hays encourages students interested in AOII or any other organization in college to take a chance and try it out.